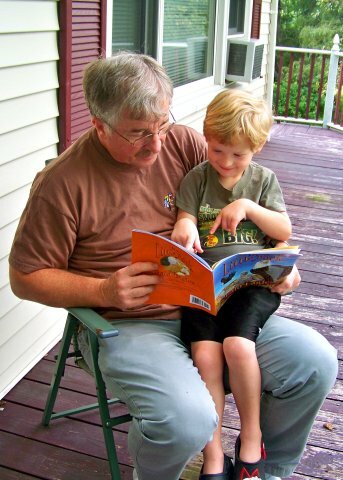 RJ shows Grandpa Bob his favorite part on the page. An autograph for Tianna, SUNY Potsdam Graduate Student. Interested in some fun-filled 'Bald Eagle' activities for kids? "A Delightful Series for Animal Lovers Everywhere! 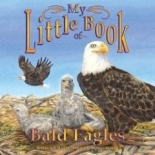 My Little Book of Bald Eagles is a wonderful tale about the bald eagle and their nesting rituals. The story begins with a new family of bald eagles and follows them along their journey of having eaglets. 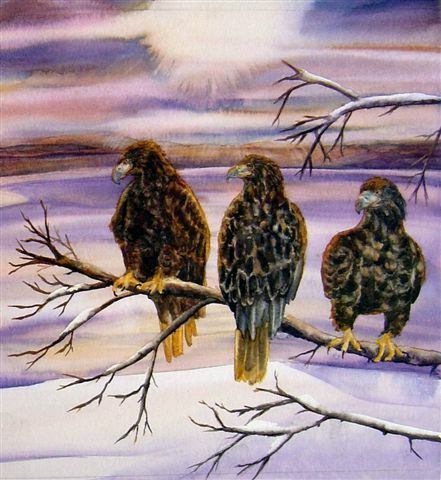 Then it continues on as the reader learns about the newborn’s first lessons in life to their first solo flight and them becoming adult bald eagles. This story is a dramatically colorful, 32-page, softcover picture book for children ages 6 and up. The illustrations are so life like that bird lovers everywhere will feel as if they are a part of the bald eagles adventure. Though the story is strictly about the bald eagle's journey, the author's passion for the bald eagle is easily conveyed in the story creating a love from the reader for the bald eagle. The author also adds info in the back of the book about the bald eagle and the fact that it is a protected species and that there are penalties for anyone wishing to hurt one. Any child that is passionate about wildlife, will love this series and the interesting truth the books convey. The reader learns a tremendous amount about the topics discussed and is perfect in creating discussion in a classroom setting." Sometimes the text is as descriptive as the art, falling down the page or stretching out, aiding the adult reader in making the words come alive for their audience. The book carries the readers through the lives of the eaglets until they are grown, years later, and in a brief author’s note, there’s even more information." Lee’s take: A fine addition to the "My Little Book" series. J.J.’s take: A fun way to learn about nature. "My Little Book of Bald Eagles is the latest book in a nature series designed and written by author Hope Irvin Marston for children ages 5-10. Beautiful natural landscapes highlighting daily habits of eagles illustrate each page of this fact-filled book. The full life cycle of a normal eagle is represented throughout the book. Solo flights, learning to fish and fly, building a nest; these are all activities of eagles that are explained and depicted. The awkwardness of the fledgling eaglets and the unstinting devotion of the eagle parents is accurately described and illustrated. Other pertinent facts about bald eagles (i.e. they are an endangered species, legal ways that American Indians can acquire eagle feathers, etc.) are found in the Author's Note at the end. 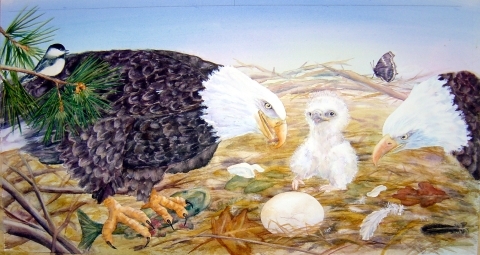 Nicely enhanced throughout with the illustrations of Stephanie Mirocha, My Little Book of Bald Eagles is an excellent naturalist's teaching tool for elementary age students." "Your children's book, My Little Book of Bald Eagles, beautifully describes and illustrates the life history of bald eagles. I am happy to have been able to assist with reviews and comments."